The Cask 88 Scottish Folklore Series will consist of six unique, single cask expressions, with each expression dictating the myth or legend it embodies. 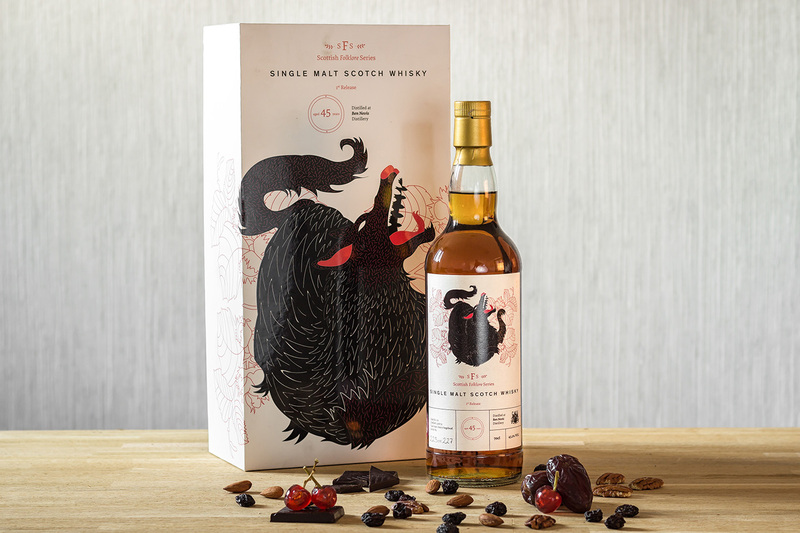 Each release in the Cask 88 Folklore series will feature a mythical beast who has roamed the highlands, stalked the lowlands or inhibited the islands. “We intend to create a fantastic collection of some of the finest Scottish whiskies, selected to represent the breadth and depth of Scotland’s world renowned culture and heritage, while playing our part in ensuring these enchanting myths and folktales endure for generations to come,” said Jonny. The first bottling in The Cask 88 Scottish Folklore Series: Cù-Sìth is available for purchase from the Cask 88 online bottle shop from Thursday 31 May 2018, and in person from Cask 88 Sales Representatives globally. This whisky’s aroma instantly flaunts its forty five long years of maturation. A nutty character alongside the rich sweetness of rum molasses are followed by luxurious notes of rich dark fruit and cherry. The indulgent richness of this cask’s dark and dried fruit character continue on the palate, but with the balance of citrus zest. This develops with notes of dark chocolate journeying into a mixture of tobacco leaves, dried herbs and a subtle oakiness. Four and a half decades maturing in a single cask provide an incredibly long and complex finish, dancing between bitter chocolate, dry tobacco and sweet cherries with cinnamon and winter spice. A rare single cask whisky with an incredibly rich and developed character. Founded in 2007, Cask 88 is now internationally recognised as one of the world’s foremost whisky experts, selling old and rare casks and bottles from world-renowned distilleries. An extensive inventory and expansive global network provide an unparalleled selection of fine whiskies, which attracts a wide clientele from London, Hong Kong, Beijing to New York. Cask 88 believes that buying vintage whisky should be fun and offers clients the opportunity to select, purchase, label and package their own exclusive whisky drawn from the finest Scotch casks.